For over more then a year I have a vintage lace blazer/kimono thing which is soo beautiful. But until now I never knew how to combine it. A few days ago Laura from Lauresque posted this outfit wearing a lovely black lace piece. 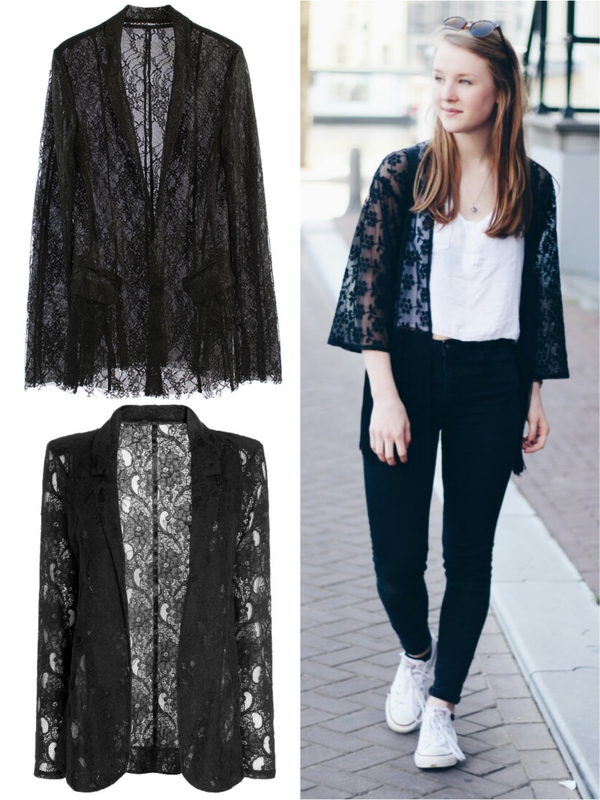 Look how simple the combining of a lace blazer can be, and it looks amazing. This way the lace becomes such an eye-catcher. So maybe there will come an outfit post with my lace black blazer soon (when there is time to shoot). For now love this outfit from Laura and I found these two lace blazers at Style Moi. I love how they still look so vintage. Ahh can't wait to wear mine soon! What do you think of this piece? Heel leuk! Heeft veel weg van een kimono! super leuk jasje, wil er zelf ook zo wel eentje. Lijkt me wel leuk voor op festivals! Super leuk! Laura's outfit is echt heeel leuk!